June 2013, Qalandya, Ramallah, West Bank. 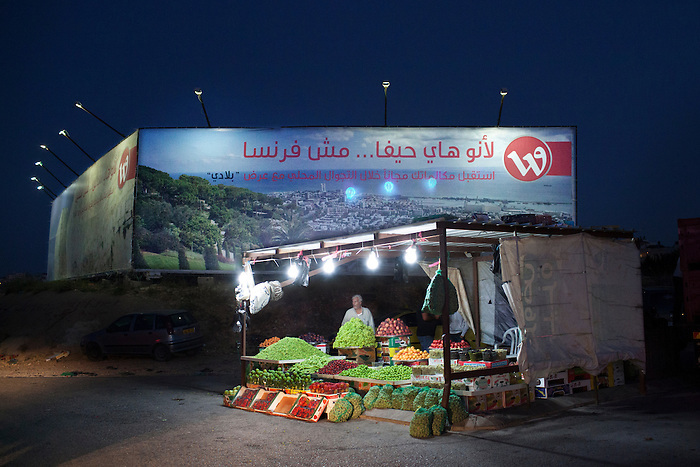 Behind the fruit vendor, the biggest advertizing sign in the Palestinian territories displays a giant picture of Haifa, a mixed arab-israli city located in Israel, where many refuges are originated from but denied the access by Israel. The advert, for a telecommunication company, targets the few privileged Palestinian who are allowed to cross the check point and to go to Haifa, offering low tariff to call from Israel into West Bank. Most of Palestinian passing in front the advert could feel bitterness, as they have never seen Haifa, since Israel has established a closure policy in the West Bank. Mahmoud, the fruit vendor, has been to Haifa once in 1998, before the separation wall was built. His sons have never been to Israel.